After San Francisco’s devastating 1906 earthquake, investors hoping to attract commerce to Oakland built a grand hotel with vaulted gold-leaf ceilings and crystal chandeliers. 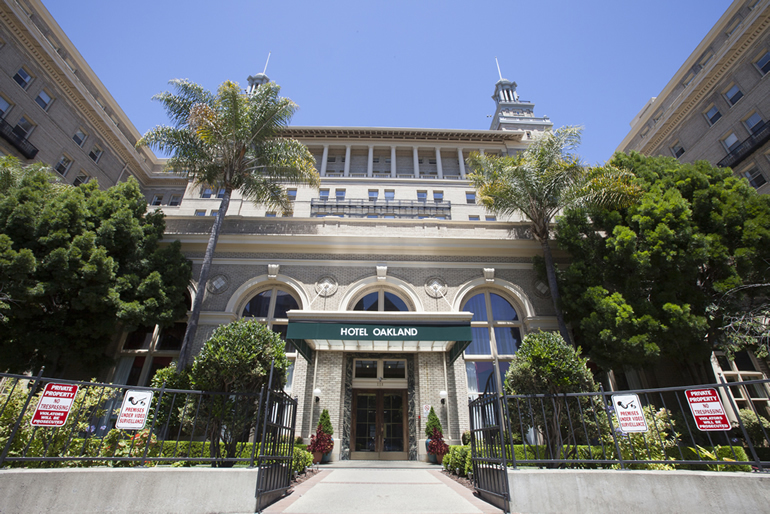 Hotel Oakland’s 1912 opening was attended by Hollywood elites, politicians, and socialites, and was called the “most important social event in Oakland’s history.” Years later, the hotel fell on hard times. In 1943, the War Department bought it, selling off the furnishings and chandeliers, to operate a VA hospital. The hospital closed in 1963, and the hotel then stood vacant for 15 years. Real estate investor Bill Langelier and partners purchased the landmark hotel in 1979 to create an affordable housing option for seniors. In 2011, Langelier formed the Hotel Oakland Village to combat isolation among its nearly 400 residents, most of whom are originally from China, with resident-led Village Health Groups that emphasize a healthy and active lifestyle. In 2015, Langelier partnered with Fannie Mae and Prudential Mortgage Capital Co., a Delegated Underwriting and Servicing (DUS®) lender, to refinance this unique property. Making a positive impact on the people who live at Hotel Oakland is a team effort at Fannie Mae.